For highway agencies, the use of prefabricated bridge elements and systems, ranging from substructures to entire bridges, is proving to be not only a best practice but good business. The prefabricated elements and systems can be manufactured offsite, under controlled conditions, and brought to the job site ready to install. Using these prefabricated systems reduces the traffic congestion and environmental impacts of bridge construction projects and improves construction zone safety for both workers and drivers. And because prefabrication can be accomplished in a controlled environment offsite, without the limitations that a job site may present, constructibility is improved, quality is increased, and the costs can be lower. Costs can particularly be reduced where sophisticated techniques would be needed to perform cast-in-place construction, such as for long water crossings or multi-level structures. Prefabrication can also lower costs by eliminating the need to perform the construction in a restrictive sequence of operations. Instead, the work can be done ahead of time, reducing the risks posed by bad weather and other variables. The more rapid deployment made possible by prefabrication can also result in cost savings. "What is the cost of time? For some projects, costs can run between $50,000 and $340,000 a day. Getting a project done even a day sooner by using prefabricated elements can mean significant savings and would earn the contractor a sufficient bonus to make up for the lower profit margin," says Benjamin Tang, Team Leader in the Federal Highway Administration's (FHWA) Office of Bridge Technology. Because prefabrication can be accomplished in a controlled environment offsite, without the limitations that a job site may present, constructibility is improved, quality is increased, and the costs can be lower. The Connecticut Department of Transportation (ConnDOT), for example, saved at least $1.1 million by using a prefabricated truss center span when constructing a new bridge over the New Haven Interlocking and Rail Yard (see July 2003 Focus). To minimize disruptions to both traffic and train service and improve work zone safety for a crew working over active rail lines, ConnDOT required that this portion of the bridge be installed in a single night operation over a weekend. 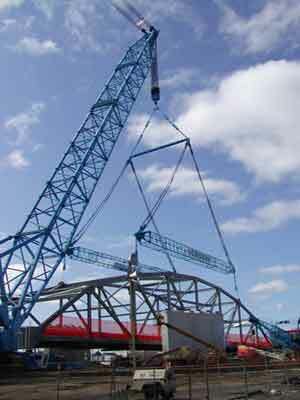 The 97-m (320-ft) long, 850-ton truss center span was constructed over several months next to the rail lines and then lifted into place on a Sunday morning in May 2003, using a mobile, high-capacity crane. A new publication by the American Association of State Highway and Transportation Officials' (AASHTO) Technology Implementation Group (TIG), Prefabricated Bridges 2004: Good Business-Best Practices, highlights best-practice applications of bridge prefabrication across the United States, including totally prefabricated bridges, bridges with fully prefabricated superstructures, and those with prefabricated full-depth decks and substructure caps. Among the projects highlighted in Prefabricated Bridges 2004 is the Wells Street Bridge in Chicago, Illinois. This 1899 steel bridge, which carries the Chicago Transit Authority's (CTA) elevated trains, was rebuilt as part of a larger redevelopment of Chicago's Wacker Drive. The project originally called for rebuilding the bridge in sections over 1 month of weekends. However, the Chicago Department of Transportation approved a value engineering proposal by the contractor to pre-build the bridge offsite and then move it into position in a single weekend. The contractor faced a financial penalty of $1,000 per minute for any delay. The work was completed over a weekend in May 2002, coming in 2 hours ahead of schedule. The 425-ton, 34-m (111-ft) long, and 7.6-m (25-ft) high central span superstructure was constructed near the site and then moved into place using a self-propelled modular transporter (SPMT). These multi-axle, computer controlled vehicles can move in any horizontal direction, while maintaining their payload geometry and keeping equal axle loads. The bridge was placed on new foundations and connected to two shorter spans on either side. The use of prefabrication meant that drivers and transit users were only inconvenienced for a single weekend. In addition, CTA saved money by not having to provide costly shuttle services for transit riders. The truss center span for ConnDOT's new bridge over the New Haven Interlocking and Rail Yard was constructed over several months and then lifted into place in a single morning. The use of prefabricated bridge elements also provided significant advantages to a joint project by the Oregon and Washington State Departments of Transportation to widen and replace the deteriorating deck on the historic 1929 Lewis and Clark Bridge in Washington. Full closure of the steel through-truss bridge was only allowed between 9:30 p.m. and 5:30 a.m. for 124 nights, in addition to three weekend closures. To meet the scheduling constraints, the contractor used prefabricated concrete deck panels. An SPMT was used to move the new panel to the top of the bridge, remove the old panel that work crews had cut out, and then lower the new panel into place. Prefabricated widening sections supported by a single longitudinal steel girder were also used on the project, as well as precast approach slabs. The work was completed in August 2004. If the prefabricated elements had not been used, replacing the bridge deck lane by lane would have taken 4 years. Alternately, full closure of the bridge would have lasted several months, or the bridge would have been closed to traffic every weekend for 6 months. The AASHTO TIG is currently concluding its work to promote and advance prefabricated bridge technology. Deployment efforts will now be led by FHWA, working with the AASHTO Highway Subcommittee on Bridges and Structures. Prefabricated Bridges 2004 is available online at www.fhwa.dot.gov/bridge/prefab/. 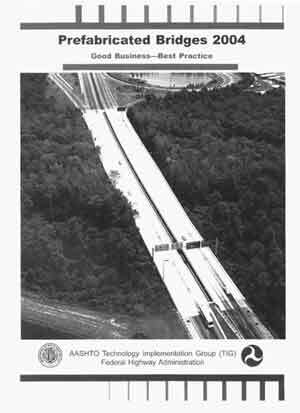 The Web site also features the summary report from the 2004 FHWA and AASHTO international scanning tour to Japan and Europe on prefabricated bridge technologies (see September 2004 Focus), as well as information on best practices, video clips of bridge projects, and details on how prefabricated bridge elements and systems are being used around the country. For more information, contact Benjamin Tang at FHWA, 202-366-4592 (email: benjamin.tang@fhwa.dot.gov). Innovative best practices around the country will be highlighted at the Third National Prefabricated Bridge Elements and Systems Workshop, to be held December 12-14, 2005, in San Diego, California. The workshop will look at how the use of prefabricated bridge elements and systems enables bridge owners, designers, and construction contractors to "Get in, get out, and stay out." For more information on the workshop, contact Vasant Mistry at FHWA, 202-366-4599 (email: vasant.mistry@fhwa.dot.gov), or Roland Nimis of the FHWA Resource Center, 415-744-2653 (email: roland.nimis@fhwa.dot.gov).